Watch your brand soar with our Promotional Frisbees! Vivid Promotions' customised range of Printed Frisbees and Fling Things are great promotional products to get your brand in the air! Available at affordable prices, Branded Plastic Frisbees and Printed Soft Folding Flyers can be decorated with your corporate logo and are sure to enhance brand awareness. 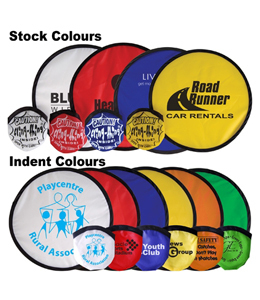 Presented in a wide range of colours to suit your company branding, Vivid Promotions' Promotional Folding Frisbees and Plastic Frisbees aren't just for kids anymore! Fling Thing Folding Flyers: Make great merchandise items for those wanting to create an impact! These Soft Folding Flyers easily fold down and fit neatly into a pouch, making them a compact and cost effective gift idea. Presented in a standard range of stock colours with a message printed on the front of the pouch or available offshore with more colours to choose from, the Printed Fling Thing offers a large print area for your message! Printed Value Flyer: Check out this low cost Promotional Frisbee for your next promotion! Available in four great colours, this economical Plastic Frisbee has a large branding area perfect for your logo. Vivid Promotions' 230mm (D) Plastic Frisbee is a sure fire way to get your brand flying around and is also a great idea to get the kids active outside. Make your next event memorable and invest in Vivid Promotions' Value Frisbee today! Promotional Frisbees have been around for years and we all know how fun they can be in the back yard or throwing a Frisbee down at the beach! The promotional products industry has put a twist on novelty merchandise items allowing you to personalise a range of Frisbees and other Flyers. Customise a Plastic Frisbee, Printed Boomerang, Eco Friendly Frisbee, Promotional Rocket Football or Branded Donut Flyer. 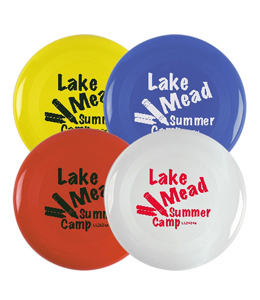 Perfect for schools, summer events, and mail out ideas, Vivid Promotions' cost effective Frisbees and Flyers are an innovative and unique way to get your brand out and about. Contact us today for a confirmed quote on 1300 72 70 92.